The fact that any of us walk is somewhat amazing, because it is one of the most difficult things for us to learn, yet we walk. Crawling, then from walker to walking. If you are around a little one, you see that look of glee when they realize they have done it! Learning to walk is just like all of the growth experiences we have. Growing means change. You balance a few times, but you get back up because the alternative is to stay the same. And staying the same disables the spirit and the body. So, you wobble, unsure of yourself, because at any moment you could fail. And then, you may wonder what people think…Some are watching to see if you will succeed. Others may be sent to help you. Nevertheless, this is your journey of discovery. This is growth. We grow in vulnerability. And change makes us vulnerable. Whether it’s changing jobs, cities, lifestyles, life partners, change you must. Growth may be frightening, but staying the same is much more damaging to the human spirit. It’s about the journey and not the destination and there are way more journeys in life than destinations. Enjoy your process. If you are struggling trying to grow, ask God for help. He is the ultimate Helper. Your punishment is..30 lashes with a wet noodle! Mistakes, failures, I’ve made a few. I mustered up the courage to tell my mother about one – don’t even remember now what it was – could have been a failing grade because I crammed for an exam and planned poorly. Or had a bad interaction with someone that damaged the relationship. Or spent too much at the shopping center. Or avoided a challenge that would have reaped a reward. Or failed at that second, third chance at something. Something. Some “thing” that upset me, and made me feel “not good enough” once again. “Your punishment is 30 lashes with a wet noodle,” then she burst into uproarious laugh. It was so loud and so long…. I laughed too. She was of course kidding. She was really saying, “Honey, it’s okay. Life goes on. You are still my child. ” Which is the same thing the Lord is saying to us all. Do not dwell on the past. Because God is doing a new Thing. Do you perceive the new Thing God is doing in your life right now? If you do not perceive it all you have to do is ask. And then forget about the punishment for not doing the things that you think you should’ve done, because God Himself has moved on. That’s right. He doesn’t even remember. He has set our wrongness as far as the east is from the west. Psalms 103:12. There are good reasons to reflect on experiences, to think about what you have learned and to offer it up as a sacrifice to God. But otherwise Mama would say, “Put a period behind it and move on.” You have punished yourself enough. And the Savior who has always been there is ready to grab your hand for that next horizon that next opportunity that new Thing. This is posted for the Write31days challenge. No food. Got to make a quick stop at the grocery store on the way home. While in the store and trying to remember if there are eggs in the refrigerator, I hear this scream. Wait, what just happened here? What turned grocery-store shoppers into super heros? The complacent into caregivers? Strangers into servants? Heathens into helpers. Compassion. It focuses you on more important things, things greater than self. Before her scream, we were all dragging ourselves into the grocery store to get Hamburger Helper. Before her scream, we were listening to the voices in our head, wallowing in our own anxious thoughts. Before her scream, we were scattered. Afterwards, focused. Before, self-absorbed. Afterwards, listeners. Before face-to-iPhone. Afterwards, face-to-face. 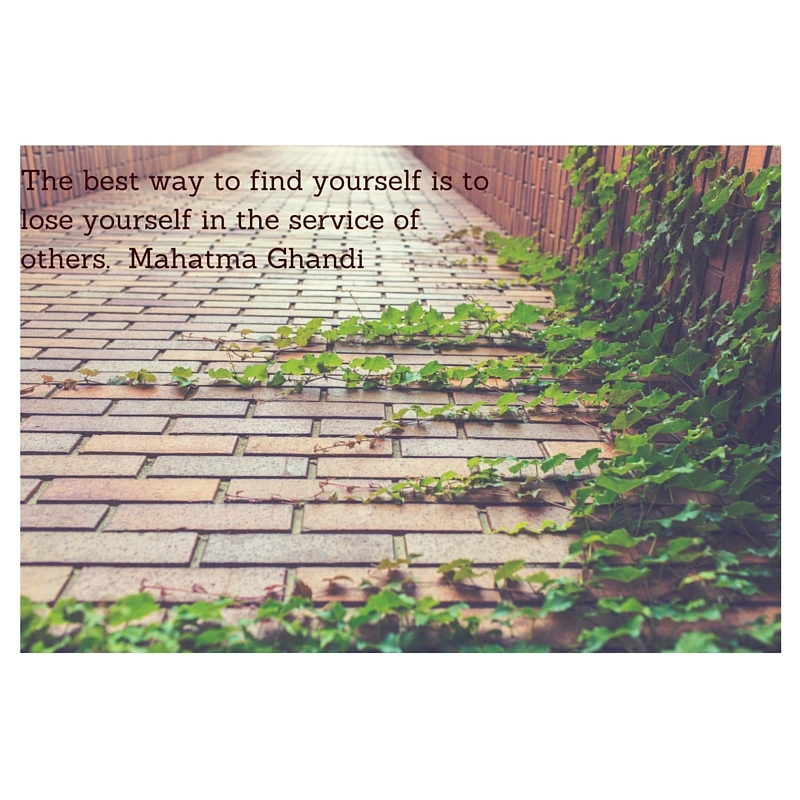 I am grateful to God for changing my focus from myself to others, to serving. I could keep up acts of service while serving the green beans at dinner tonight. I could make the dinner experience more delicious by focusing a little less on myself, and a little more on family and friends. I could become focused, attentive, listening, face-to-face instead of face-to-iPhone. I could keep it going, giving and receiving His compassion. My husband (referred to as “my Lover”) is a wonderful person. He loves God and his family, is kind and sometimes cleans the house without being asked. He is a jewel, really. But sometimes, he does strange things – such as leaving empty plastic Tupperware that once stored food on top of the countertop. You might say, “Well, that’s not that strange.” But I ask you to look at the picture below where you will see the Tupperware by the toaster and, a few feet away the dishwasher – that appliance created to wash dishes for you. So, why would my lover leave this plastic stuff sitting on the countertop? Answer, it is just one of those strange things he does. These strange things can also be called quirks, idiosyncrasies and just like we all fall short of the glory of God we all have these strange things. So, of course I thought, that’s not strange and in fact, there are perfectly good reasons for sitting in the dark, but from someone else’s perspective it could seem quite vampire-like. So this is just another example of how different we all are and how differently we see the world. We are all different, have different ways of doing things, different strengths and weaknesses, pet peeves and levels of patience, viewpoints and experiences. We’re different – what bothers one – doesn’t bother another. I have no problem with sitting in the dark and my husband has no problem with dishes on the countertop. In the long- and the short-run they are no big deal. They just are. There are a multitude of ways to respond to differences but they essentially fit into two camps – appreciation or judgment. I could actually respond to the dirty Tupperware with appreciation by remembering that the food that was once there we could afford to purchase, also it was prepared by a wonderful person who prepared meals for my aging parents (which is all true). And my husband could respond to me sitting in the dark with an appreciation that I wasn’t nagging him and that I was spending time talking to God (which is also true). There are some differences that are irreconcilable – such as differences in values. But if you can get on the same page with mission and values, other differences can be managed and in some cases appreciated. Differences are necessary – God didn’t make us all the same intentionally so that we could rely on, relate to and appreciate each other. We have gifts differing. That same spirit that raised up Christ from the dead is alive IN YOU. This story is one that I wouldn’t have believed unless I was there to see it. I admired one of the deacons at my childhood church. He had what we used to say was one of those “good” jobs as an autoworker for many years. Steady employment enabled him to live modestly, while his wife stayed home and cared for the children. He purchased nice cars, including one year the leanest, meanest delta 88 you ever wanted to see – shiny black and gold, black on the bottom and landau gold top. Then, he topped it all off with very expensive spoke wheels that glistened in the sun. I was impressed by this car and so was everyone else. Because Deac got to church early, he was able to park it right up front. Sunday morning sunshine shining on the shiny, stainless-steel spoke wheels could blind you with bling. And since he got there every Sunday early, he could park it right it front of the church. One Sunday, as he did every Sunday, Deac got out of his car, went inside to teach Sunday school. While he was in the building, a man was outside of the church building, pulled up right beside Deac’s car. Moma, “look,” I said as I saw this dusty-haired man drive up in a beat-up hoopty right by Deacon prized posession with crowbar in his hand. I ran down the church aisle to pull Deac away who was just preparing to teach Sunday school, when I told him, “Deacon M, somebody is messing with your car. A man I don’t know.” He ran past me so fast…I turned my head he was gone, his Florsheim shoes clicking against the concrete was faster that the faster clydesdale horse. He ran into the street after a car, yes, a car, with a dusty-haired criminal driving off with his hubcaps. The Deacon morphed in front of my eyes from middle-aged man to SuperBad. With the speed of Carl Lewis, Deacon M bolts out of the church, down the stairs, down the street, in his best suit and his best shoes Deac takes off on foot, and catches the thief. He opens the car door, and a tussle ensues. He hits Mr. Dusty, gets his hubcaps and returns triumphantly to no Olympic medal, but to a cheering and awed crowd, Momma and me. Deac brushes off his suit, straightens his tie, returns to teaching as if nothing happened. Although this may seem impressive it isn’t nearly as impressive as the superpower Deac really was in life. He was a calm, loving servant to the church, taught Adult Sunday school, took care of an ailing wife and never, I mean never treated anyone unkindly. Keep in mind that he taught Sunday school, which means that he spent hours preparing to arbitrate the great debate that occurred every Sunday about topics such as divorce, money and when Jesus was returning. Sunday morning had all the drama of a soap opera and yet, this deacon remained calm and collected diligently serving for years. Deacon was one of the sweetest most loving persons you could ever meet. Deac was powerful because he relied on the power within him to live a life pleasing to God. This is a salute to all of the Superbads out there – thank you for being you and letting the real Superpower live in you.